As an aid to preparing your design it is necessary to consider the above requirements of each space in your brief. It may be a quiet activity, which could be next to a noisy one. In which case the dividing walls/floors will need to be thicker to reduce sound transmission. The activity may require plenty of light or no light at all. It may need to be heated to a different level it could even be a cold room, which would need to be insulated from adjoining heated spaces. It may need to be ventilated to a greater or lesser extent (fumes dust etc.) All of these factors can affect structure, construction, services etc. Computers may require networking, machinery will require power, and some machinery may require dust/fume extraction all of these points will need to be considered. Some activities will require harder wearing finishes than others. Indeed the client may have specific requirements. Suspended ceilings may be required to cater for future flexibility in running services etc. Food preparation areas will require hardwearing cleanable surfaces and tiles or stainless steel splash bands. Some activities will require fixed or mobile benching, shelving, safety caging. Which all need to be considered? A building may contain a complete process involving the passage of goods and materials from one to another in a specific order. That order may dictate the relationship of one space to another. As you can see they are all inter-related and until all have been considered it may not be possible to fill in the whole table in one go. You will find it a continuous development process but it will guide you in the right direction. Let us look at this key analysis tool by examining the requirements of a poolroom for a residential building. Area/volume The “Metric Handbook” is a useful source of data here, as it often gives area requirements of spaces. However, we can look at it logically and still arrive at the necessary requirements. We can start with the size of the pool table, and then add a reasonable margin of space around it for the players to operate in. You can obtain the table sizes from the manufacturers. Some manufacturers recommend 1200mm clear around the table and some 1500mm. whilst the cues are usually 1200mm long it would be wise to go for the larger clearance to cater for players with long legs, as one leg is normally outstretched. For competition venues you would need to contact the sport’s governing body as they may have stricter rules, than domestic or leisure clients. In order to facilitate uninterrupted play we must also add a circulation area around that. This will allow one player to pass behind another even during play. 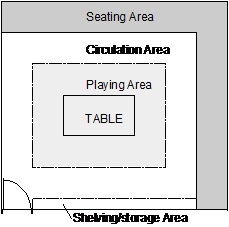 This circulation space can also be used by spectators and be further aided by providing an additional area for seating. It may also be advisable to provide shelving and storage for pool cues, drinks, storage and other items. Doors need to be positioned so that they do not encroach beyond the circulation zone. The height of the room needs to reflect that a person playing pool may raise the cue above their heads. A height of at least 3 metres would be wise. So from this exercise we can determine the area and volume necessary for the function of the space. A pool table is a heavy piece of equipment (see specification above) and any floor needs to be designed to take the weight. Perhaps a concrete floor or a timber floor with additional joists would address this issue. They also require a lot of light, usually provided from a canopy over the board. These canopies are heavy too. So we must ensure that a secure fixing position is provided at ceiling level. The walls and ceiling may also need to be resistant to the passage of sound (dependant on the adjoining uses). Indicating a heavy construction, the more mass the better the sound resistance. Suggesting brick or block construction. As mentioned earlier a good level of light is required and a reasonably consistent temperature to ensure the stability of the pool table playing surface. It needs to reasonably free from draughts, which may effect the correct movement of the balls around the table. External/day-lighting may not be required so the room could be internal if necessary. Clearly power is required for the lighting canopy; background lighting might also be required for spectators and to permit cleaning without the need to switch on the main lights. A power socket should also be provided for cleaning purposes (Hoover). As discussed earlier heating may need to be provided. If the room is internal, then an extract fan will need to be provided. However, it needs to be located so that it does not affect the play. Pool cues can cause damage to surfaces, so it is best to consider the use of hardwearing or easily repairable surfaces. As a minimum, a scoreboard, shelving and a pool cue rack should be provided. The requirement for further fittings would need to be discussed with the client. This needs to be discussed with the client in depth. Whatever is decided, it would be best not to make this space a route from one area to another, as this may affect the enjoyment of the participants. As you can see the analysis is sound and should if followed result in a successful space. Try to apply this to the rest of your brief to produce a table of requirements for each space or function. Remember to check back against it at regular intervals to ensure that all of the recommendations have been incorporated successfully. You may also consider an additional tool, the “Life style” analysis method, which is predominately for Domestic projects. It should not be considered as a replacement for the conventional method, but supplementary to it.